Boy this blog is in seriously high holiday gear lately — which I guess makes sense — but as you know, I always like to have at least one decent family dinner idea on the home page at any given time. That is the bread-and-butter of this whole operation after all, and you can count on me never forgetting that. (Special shout-out to you emailers who remind me of this all the time! 🙂 ) Anyway, today’s Hanukkah-heavy photo probably looks like it’s one more day I’m ignoring your quick-and-easy meal-making needs, but here’s a question: Why shouldn’t you use these never-fail latkes as the foundation of a December weeknight dinner? 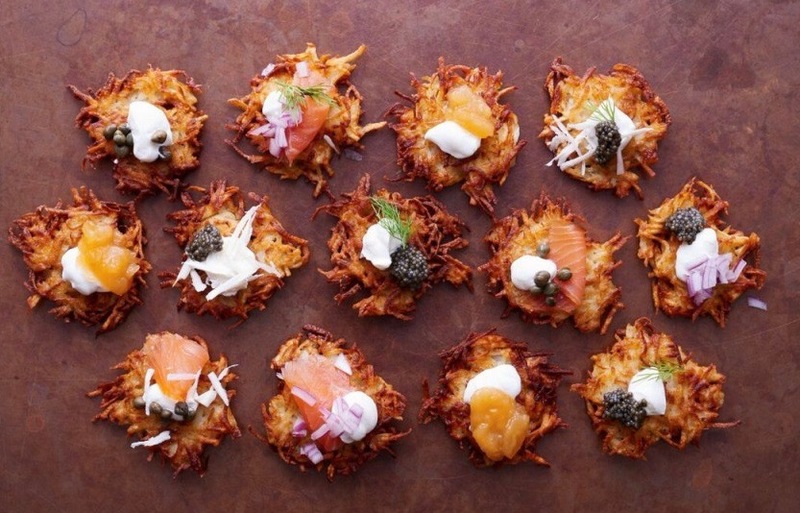 For holiday parties, we often make a “latke bar,” and offer a platter of mini potato pancakes with lots of topping options like you see above. Why shouldn’t you do the same for dinner? (And just maybe add a green salad for good measure?) For further inspiration, a video tutorial below — the latest in my HTCE series — which will fill you in on all the deets. For book owners, the recipe is also on page 73. P.S. Just for fun, here’s what we’ve had for dinner this week so far: Monday Ragu Hand Pies (leftover Pork Ragu, wrapped in pie dough and baked at 375°F for 25 minutes) and Chopped Romaine Salad with shallots, herbs, feta and this dressing; Tuesday Awards Dinner in a Banquet Hall; Wednesday Roast Chicken Thighs with Mashed Potatoes and broccolini pan-fried with shallots in cast iron skillet after chicken was removed. Tonight: I’m thinking this. we ate leftover latkes with our eggs this morning — so good! I LOVE latkes! But we don’t have a great hood fan and it seems like our whole house/clothes/selves smell like fried oil for days after making them. My husband has made me promise that if we do it again this year we will cook them on the propane camp stove outside. I love the idea, but with below zero temps this morning, that doesn’t sound as romantic. Any tips for minimizing the smell, or does it just go with the delicious territory?